If you’re planning a visit to Sri Lanka’s Hill Country, you’ll surely want to do some walking. And if you’re a senior traveller, you’ll probably want your walks to provide spectacular scenery without exhausting climbs. There are lots of options, depending on where you decide to stay. The busy city of Kandy and the town of Ella are probably the best-known destinations in the Hill Country. But the city of Nuwara Eliya, which lies between these two, surrounded by green hills, is also an appealing destination. The city was once an escape from the heat of Colombo for British colonial officials. 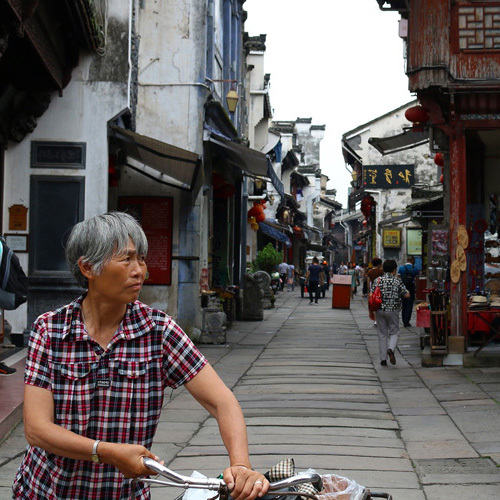 Although it has grown extensively over the years and lost some of its quiet charm in the process, it still has a slightly English feel to it, with its old bungalows and colonial-style hotels. Surrounded by wonderfully-green tea plantations, and with the man-made Lake Gregory at its heart, it’s a place to unwind and enjoy the cool weather. You can choose to stay in the town itself or in the nearby hills. 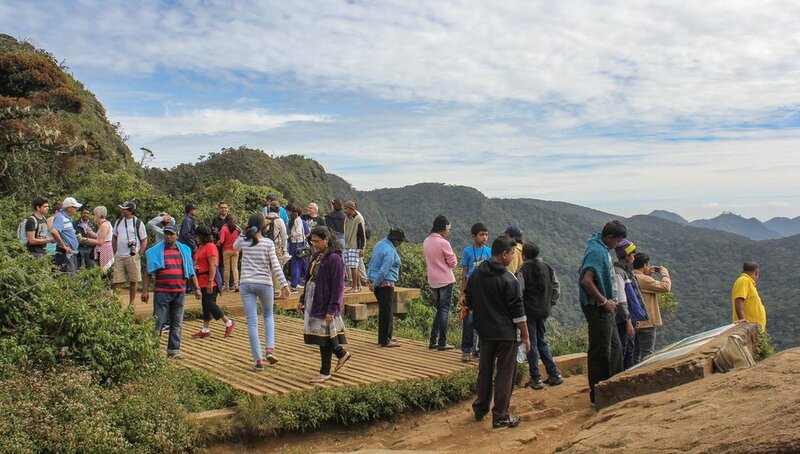 For those with walking in mind, Nuwara Eliya has the advantage of being close to World’s End in Horton Plains National Park, in the mountains above the city. It offers some of the finest views in the Hill Country. World’s End can easily be reached in a day, setting out by car from the city in the early morning and returning in the afternoon. You need to be reasonably fit to tackle the walk – you’ll feel it at the end of the day – but it should be within the range of most older travellers. You can do it as slowly as you like, taking plenty of time to catch your breath and enjoy the views. The easiest way is to arrange with your hotel for a car for the day. The 30 kilometre drive from the town to the national park entrance takes you through beautiful mountainous country with lookout points where you can stop to enjoy the views and take photographs. On the way, you pass sleepy Pattipola, the highest railway station in Sri Lanka, on the main line from Colombo to the Hill Country. You’ll have to fork out US$20 or more to enter the park, depending on the going exchange rate with the Sri Lankan rupee. From the entrance, your driver will take you to the trailhead to begin the hike. Apart from good walking shoes or trainers, you’ll need to wear a hat and carry water and snacks (but don’t take any plastic bags; they’re banned in the park). The circuit across the Horton Plains plateau to World’s End and back is around 10 kilometres. The walk is likely to take you three to four hours, including time spent taking in the views at World’s End. Though reasonably wide, the trail is uneven at times, so watch your footing. There are steep bits and rocky patches that need to be handled carefully, especially if the ground is wet, as it often is up here in the mountains. You don’t need a guide. The trail is clear and you’ll most likely be sharing it with many other walkers, from groups of schoolchildren to senior visitors. The walk takes you through high-altitude grasslands interspersed with cloud forest. If you’re a keen walker and want to extend your hike, a track leads to Baker’s Falls, an attractive 20-metre-high waterfall. World’s End itself is a lookout on the edge of a sheer precipice that descends almost 900 metres to the valley below, with mountains on the other side and a distant view towards the coast. Far below are the houses of tea estate workers. On a clear day the views are dramatic. Swirling fog often gets in the way, though; the best way to try to avoid it is to be there before 9am. The tea plantations that surround Nuwara Eliya also provide excellent opportunities for walking, especially if you’re staying in the hills rather than the city. It’s best to set off early in the day, and probably easiest to arrange a guide through your hotel. My wife and I did a two-hour walk through a hillside tea plantation with a young guide from the local Tamil community, which provides most of the workers on the tea estates. It was a rainy, misty morning – it happened to be Christmas Day – and the feeling of being away from it all was something to savour as we made our way slowly through the tea bushes, sheltering here and there from the drizzle and chatting to our guide about life on the estates. The tea estates also provide the opportunity to visit a tea factory, something that many visitors to the Hill Country want to experience. There are several factories near Nuwara Eliya to choose from. Single Tree Hill offers a fine view of Nuwara Eliya. The easiest way to get there is to take a taxi or hired car to the temple on the hillside. From there it’s a walk of about 20 minutes to the top of the hill. Nuwara Eliya has a full range of hotels, hostels and homestays, some in the town area and others in the surrounding hills. If you’re looking for top-end comfort out in the hills, you may like to try the Heritance Tea Factory in the village of Kandapola. This converted tea factory consistently gets good reviews by travellers on TripAdvisor. The colonial-era Grand Hotel in the central area is probably Nuwara Eliya's best known hotel though. It offers comfortable accommodation at about half the price of the tea factory, and is also known for its English-style high teas. It began life in 1891 as a house for the then British Governor of Sri Lanka. But it’s not a genuine 19th century building. It has been extended in layers over the years, with the top layer, in Tudor style, being added only in the 1930s. A more authentic remnant of the empire’s glory days is the Hill Club, built in 1885. It was once only for white men; Asians and all women were barred. It remains a members-only club today but visitors are given temporary membership, provided they dress smartly for dinner: men require a jacket and tie. Visitors often wonder how to pronounce Nuwara Eliya’s name correctly. When spoken, the two words tend to be joined and shortened to sound something like Nur-Reli-Ya.